Raith Rovers are hoping to unveil their latest summer signing this afternoon. Attacking midfielder Lewis Milne is due to put pen to paper after making the move from newly-promoted Montrose. The 24-year-old had signed a new two-year deal with the Angus club last month, however, he has exercised a release clause that allowed him to leave for a full-time club. 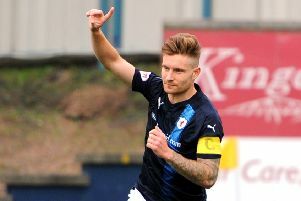 Milne, who previously played for Cowdenbeath and Forfar Athletic, scored 11 times last season as Montrose clinched the League Two title. He has been taking part in pre-season training with Raith and is expected to become Barry Smith’s fourth summer arrival this afternoon.